This entry is posted by Norman Adams. I wish to address the uniqueness of AA Clay and the wonderful asset of the gallery in this, none-too-subtle, plea to shoppers. 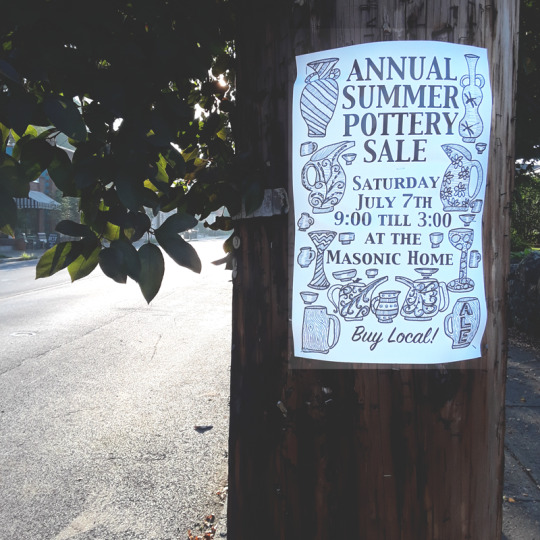 Louisville has many treasures and I think this one is worth knowing about, especially if you are interested in ceramics. While most people would consider a day spent making clay pots not a normal day at the office, those who do are not just fiddling around. AA Clay Studio & Gallery offers a space where the art created by the studio artists is available for purchase. 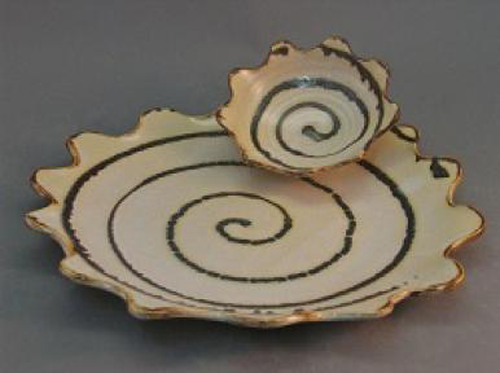 Conveniently located near Churchill Downs at 2829 South Fourth Street the AA Clay Gallery is the best place to shop for unique locally handmade ceramic articles. The active working studio artists and other selected artists at AA Clay Studio & Gallery present handmade objects for your pleasure. Gallery hours are the same as open studio hours listed with this blog. Christmas shopping was never easier. Shop now before the holidays and you’ll be glad you did. 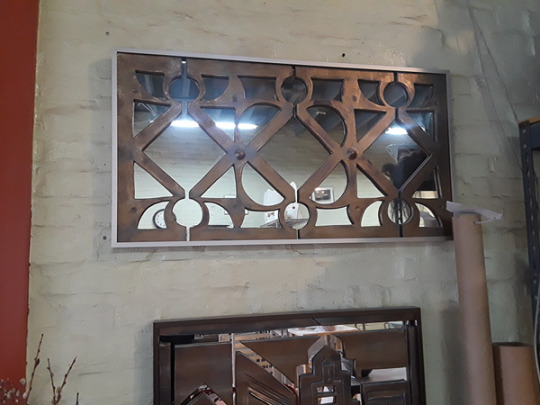 The gallery offers new items regularly so shop often. The gallery now offers an online site where the purchase and shipping can be easily invoiced to your card. 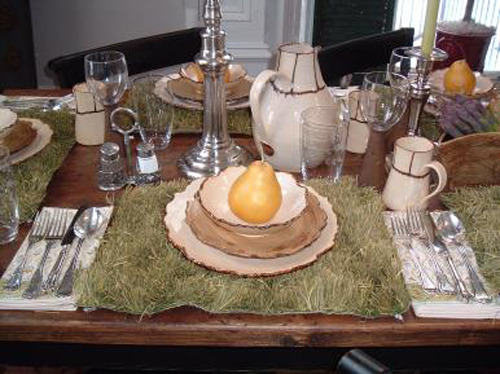 The joy of gifting is always special but think how more special the sentiment when the item is locally hand made! 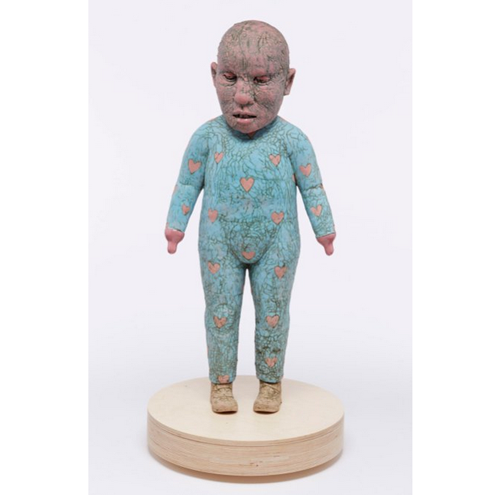 AA Clay can ship any of the gallery items to any destination you wish so make your choice and ask them to ship it to your far-flung relatives and friends pining for a special touch of Louisville. Thanks for listening to my plea to patronize this truly unique Gallery/Gift Shop. I think anyone who visits will find their time well spent. And happy holiday shopping! 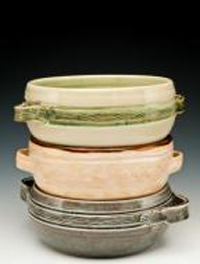 Now AA Clay Studio & Gallery offers an app for your phone to make shopping for beautiful handmade ceramics even easier. The app is for Apple and Android. Click on your system icon below for your FREE download. What is the life of an artist and what does it take to be successful? Amy Elswick has the answers. I met with Amy at her renovated, spacious studio/home on East Chestnut in Louisville, KY.
Amy’s Appalachian heritage includes parents, aunts, and uncles who took the opportunity to explore and learn at Berea College. 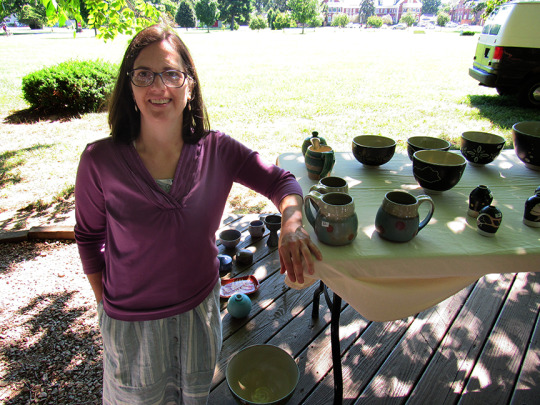 She used her years at Berea to work in the ceramics studio as a production potter where she could experiment with numerous clays, glazes and techniques. Amy began as a Spanish major who subsequently found that clay “fit her hand like a glove”. 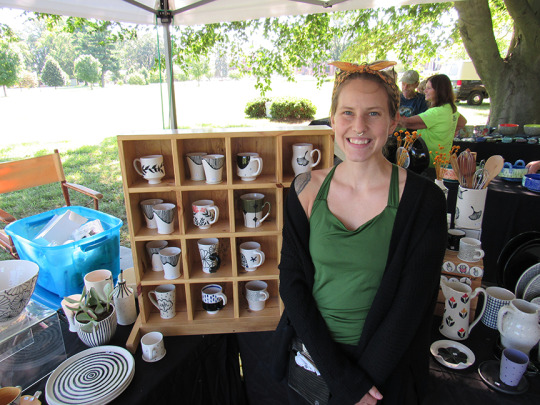 In addition to pottery making, Amy learned pottery selling at Berea. 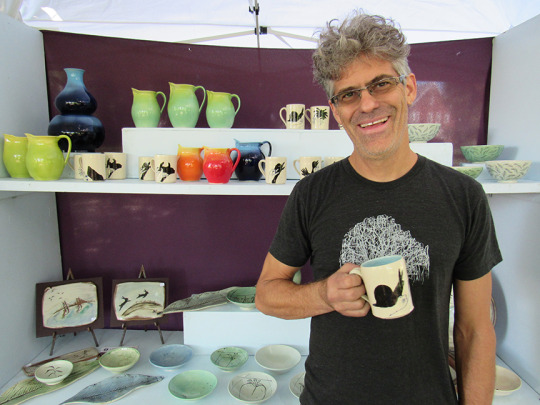 The Craft Marketing Program taught students to use craft as a career. She sold her student work through the college gallery and learned basic marketing techniques. 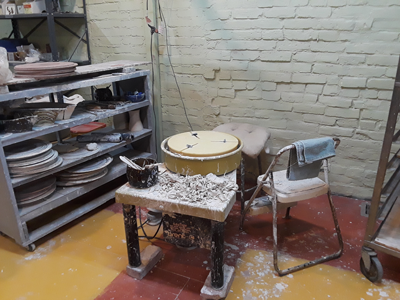 Imagine a young potter who also had the dream of promoting exchanges of the arts throughout the Americas (remember her studies of Spanish cultures). Amy traveled to the American southwest to test her role in the local environment. 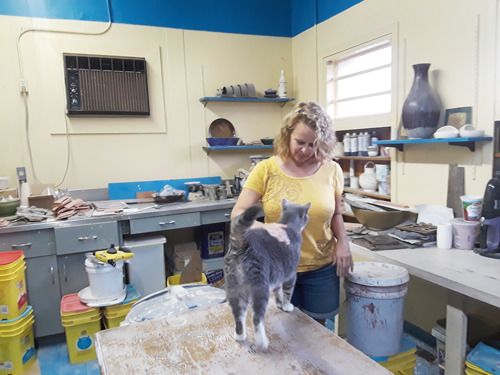 She returned to her hometown Louisville ready to make pottery that connected her traditional Appalachian background with the clay works of Pre-columbian pottery and architecture. 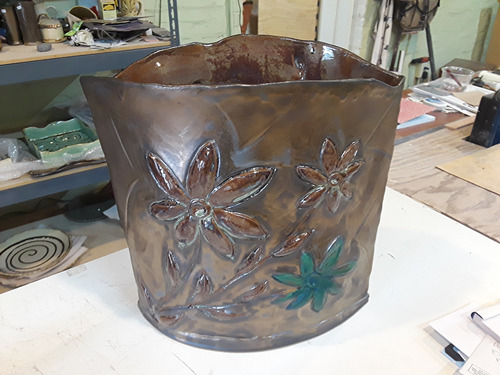 Take a look at Amy’s website clayhousepots.com and you will recognize that her imagination takes hold when she uses clays, glazes, brushes, and carving tools. 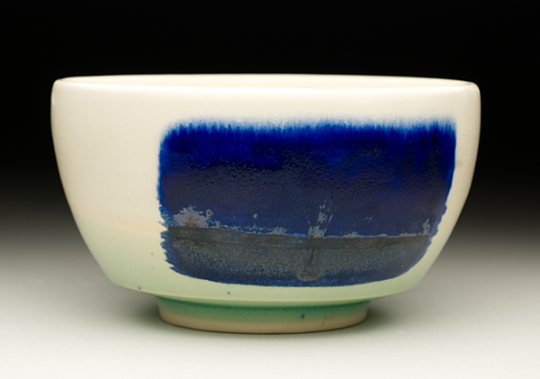 She consistently produces dinnerware, gondolas, platters, drinkware, bowls, and vases. 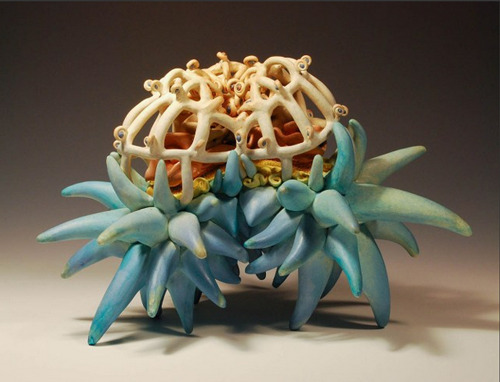 Amy’s work includes sensitively carved vases, fluid spiral patterns painted on inviting bowls, gondolas with surface treatments that are as intriguing as the food within. 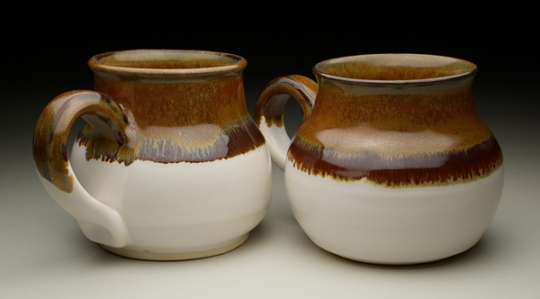 Notice the earthy, restful glazes that are reminiscent of colors in the Kentucky mountains. 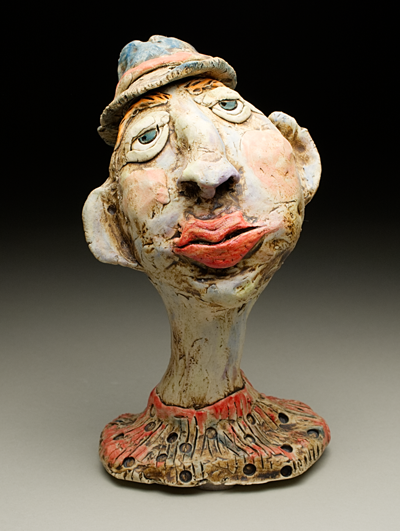 In short, Amy Elswick makes pottery for lovers of the expressive range that only clay and glaze can create. 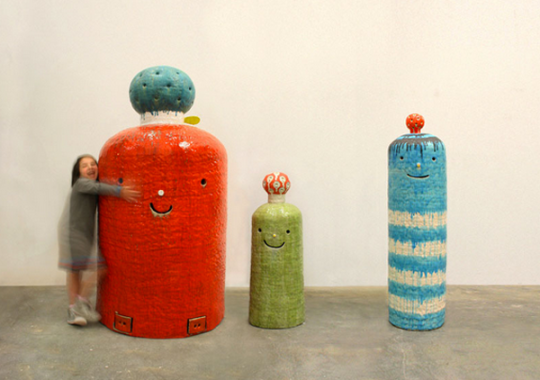 Amy’s work has evolved into large hand built vessels made to hold such items as magazines and fireplaces accessories. Her architectural mirrors are particularly strong in ceramic form and pattern. Asked what she plans to do in the future, Amy presented a large (approx. 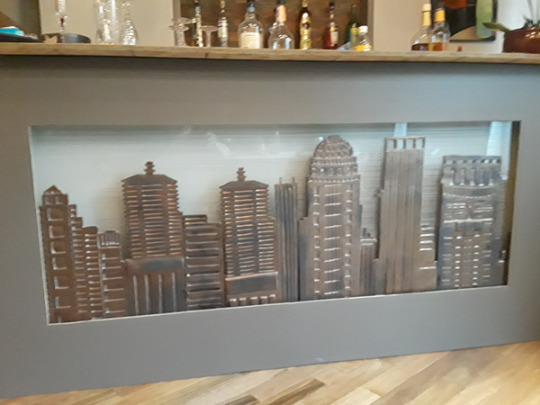 6 ft. by 2.5 ft.), nicely carved ceramic relief of Louisville’s downtown profile, mounted on a lighted glass background suitable for fronting a counter or bar in one of Louisville’s commercial establishments. I like the way she thinks. We shouldn’t leave this profile without mentioning Amy’s marketing skills. 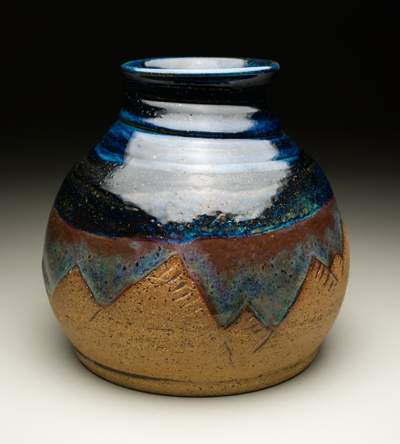 As a young potter, Amy worked for two artists who sold pottery and art nationally, at high prices. 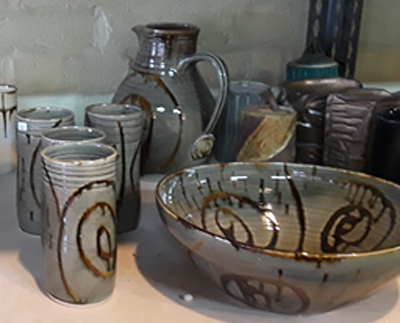 Three years with Dana Major and Serge Isupov provided her with the knowledge that pottery is a business that requires organization, confidence, and a practical, energetic work ethic. It even requires that the potter become artful at packaging ceramic works. Amy’s business is one in which she makes gallery connections at national wholesale markets, such as the American Craft Council show. She reliably fills orders by first determining how much money she needs to make at a show or gallery, then outlining production methods and outcomes that succeed in fulfilling her plans on time. 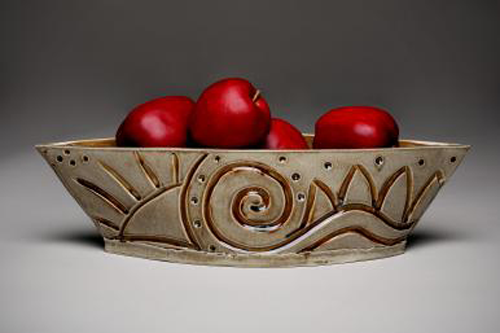 We see in Amy Elswick a potter who knows the business front and back; a potter who is a model for anyone with the passion to combine creativity with ceramic technique to produce forms that exemplify a sincere personal philosophy. We in Louisville are fortunate to recognize her as a successful, Independent Artist. Thank you, Amy. Days before the big event posters go up. L.O.C.A.L.S. 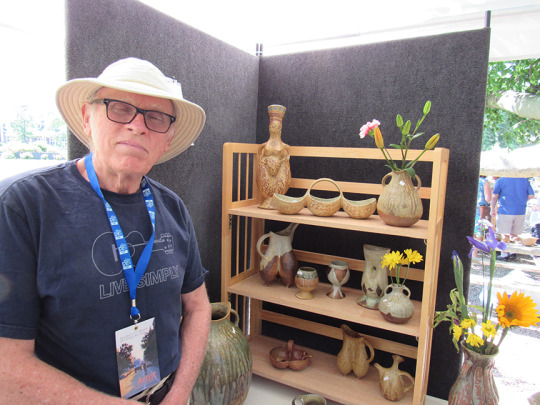 is a group of Louisville potters who have come together since the 80′s to support each other and to present two ceramic sales events each year. 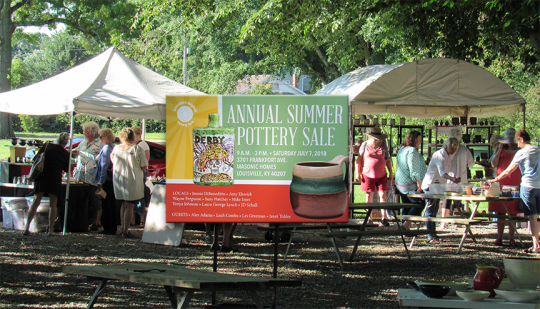 The Summer Pottery Sale took place on July 7th this year. The Holiday Sale is held on the weekend following Thanksgiving. 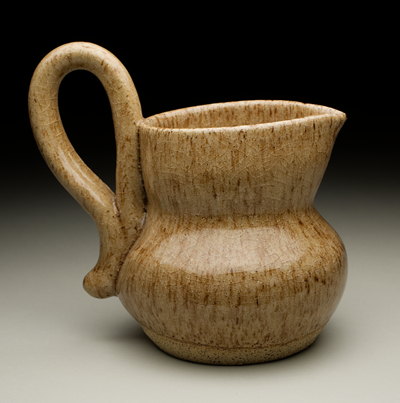 You can find detailed information on LouisvillePotters.org. 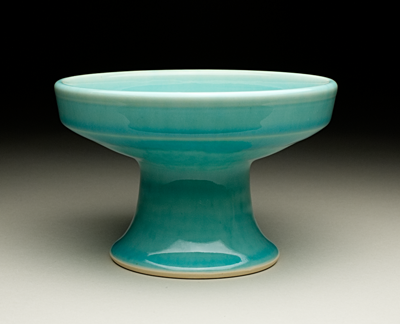 For the clay enthusiast there is a lot to like about this group of potters. Take a look at their website to find links to individual artists. 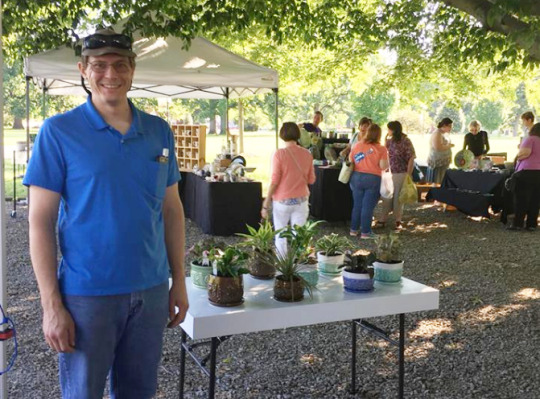 Exhibitors at this year’s Summer Sale were: Jennie DiBeneditto; Amy Elswick, Wayne Ferguson; Suzy Hatcher; Mike Imes; Tonya Johnson; Laura George Lynch; and JD Schall. 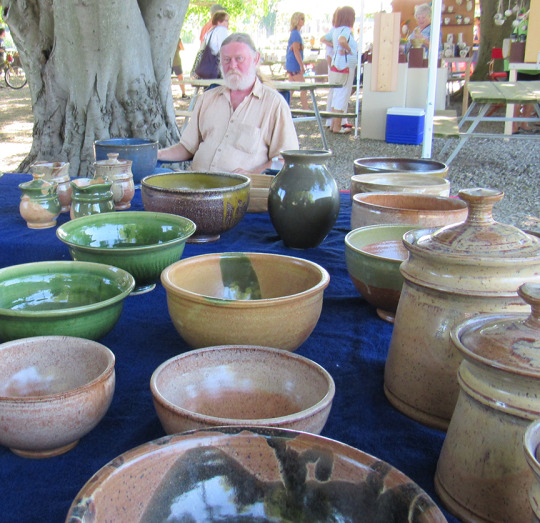 Guest artists were: Alex Adams; Leah Combs; Les Freeman; and Janet Tobler. L.O.C.A.L.S. 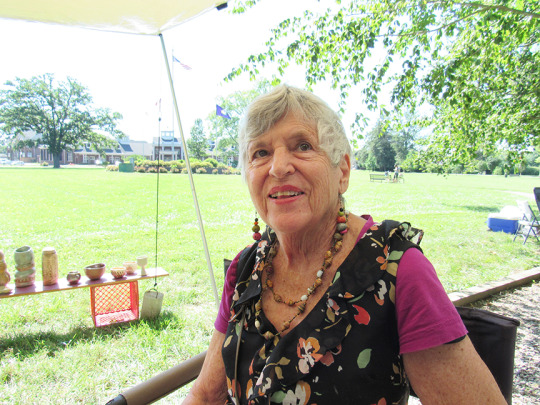 (Living On Clay and Louisville Soil) began in the early 80’s when Sarah Frederick invited artists to join a Holiday Sale at her home; followed by a summer “seconds” sale. 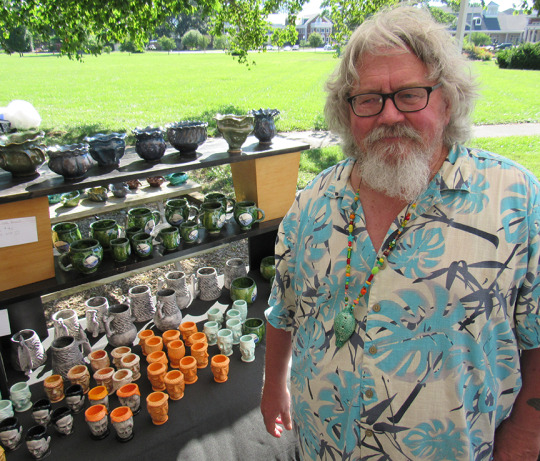 These well-attended sales events provided opportunities for clay artists for many years. 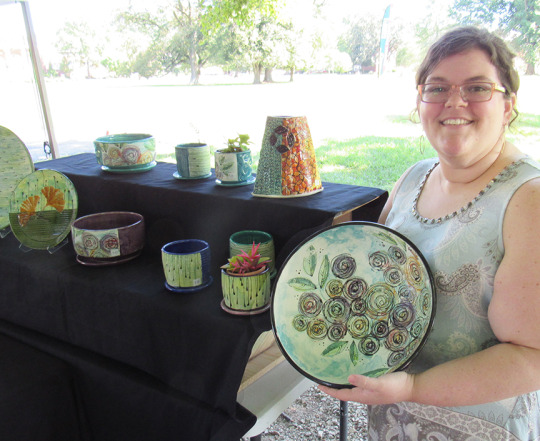 Sarah continues to be a strong, positive presence in the Louisville clay community. If you were at this year’s Summer Sale you would have heard comments from exhibitors like: “The customers were happy and interested in my work.” “Sales were very brisk.” From consumers you could hear these comments: “What a fun and easy way to spend the day.” “The variety of items and quality of pottery are what I’ve come to expect.” The weather under the Masonic Home shade trees was spectacular. Enjoy scrolling through a few of the exhibiting members and guests of L.O.C.A.L.S. 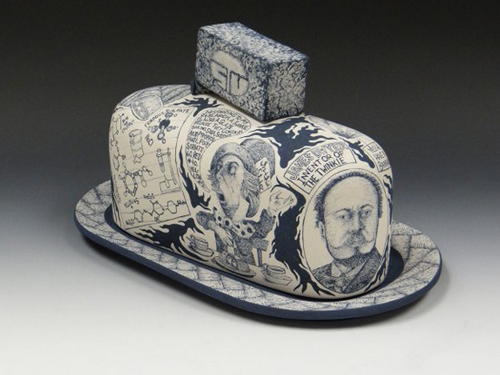 artaxis.org promotes the professional pursuits of a growing network of ceramic artists. 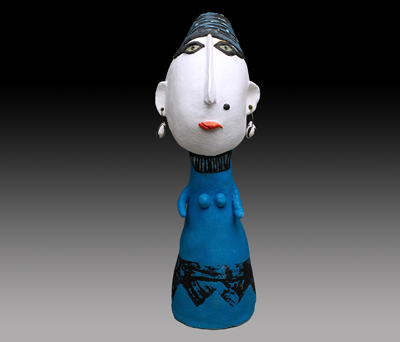 Mission: to enrich the ceramic field while providing a direct conduit between artists and viewers. What can be found on the site? Current Call For Entry: www.callforentry.org. Brian Harper, www.brianharperstudio.com. of Indiana University Southeast, founded Artaxis is 2005. Brian currently serves as executive director of the international non-profit website. The website receives thousands of views everyday from around the world. 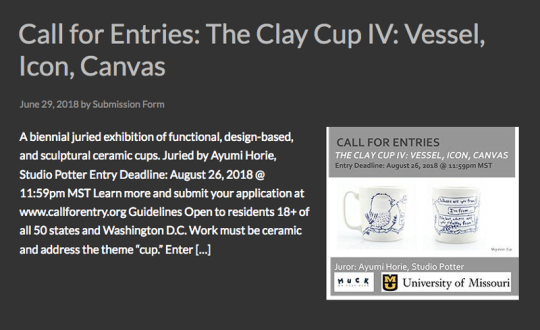 Artists, curators, gallerists, educators, students, and ceramic enthusiasts use the site as a source for peer-reviewed ceramic art. Over 600 artists from 40 countries have been juried into Artaxis. The jury process and all other activities are managed by volunteers. 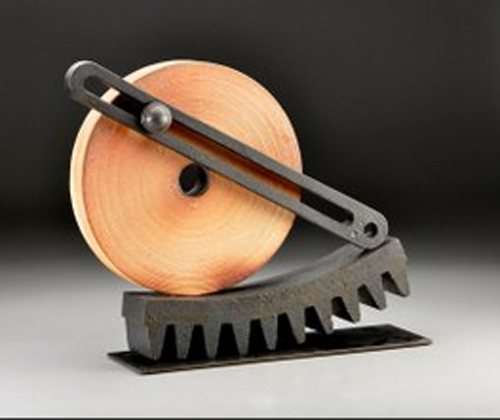 Prospective members of Artaxis are juried by current members. The process rotates between over 300 jurors, seven at a time, and is completely anonymous. The inclusion of so many jurors allows each Artaxis member to have a voice in the direction of contemporary ceramics. 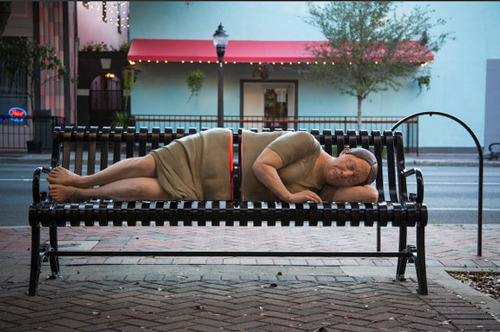 Sculpture; Vessel/utilitarian; Figurative; Installation; Imagery; Time- based. These categories, used by Artaxis to present the variety of members’ works, are an indication of the strength and range of ceramic arts today. Check out artaxis.org. 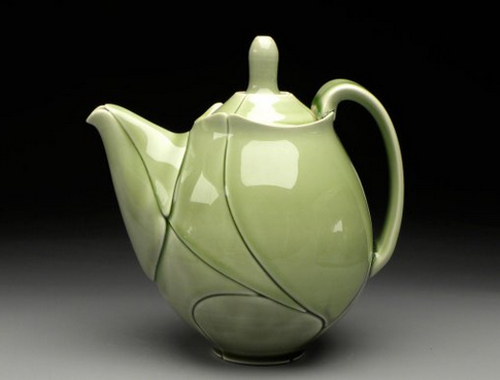 Be jazzed about ceramics. 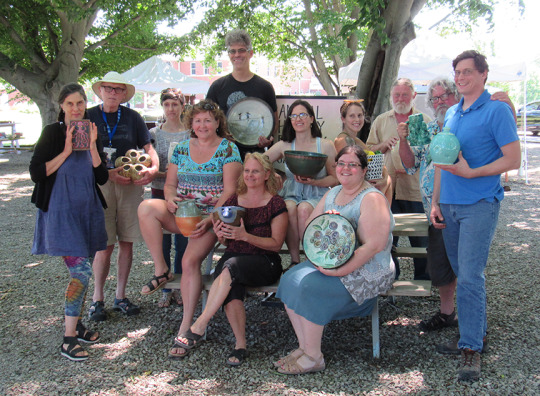 AA Clay is Louisville’s original open-studio for ceramic artists. We proudly present seven of our member artists in an exhibition and sale that is open to the public. 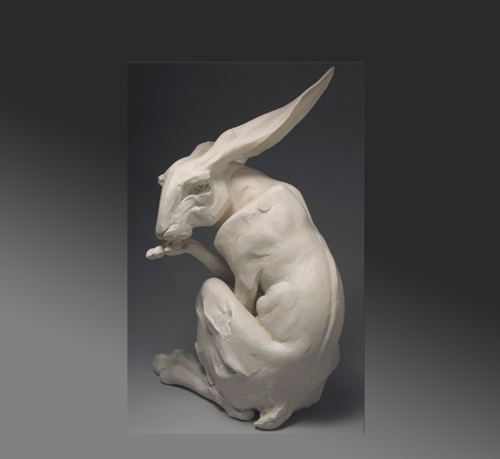 AA Clay Studio and Gallery is a community of artists from Louisville and southern Indiana. We support each other through networking, advising, and encouraging. Tuesday 10 a.m. – 4 p.m.
Wednesday 4 p.m. – 8 p.m.
Thursday 10 a.m. – 4 p.m.
Saturday 12 p.m. – 6 p.m.
Sunday. 12 p.m. – 4 p.m.
We are currently building an online gallery. Connect to our gallery at aaclay.com.